"Is there any other thing I can do in Lake Sebu besides taking the zip line?" Like my friend who has aversion to heights, many people, especially those who are not keen on adrenaline-pumping adventures would most likely ask this question. It's given: Lake Sebu is now synonymous to the Seven Falls Zipline. But South Cotabato's premiere destination for both foreign and local tourists offers a lot more. Travellers who want to spend time to commune with nature or relax from hectic urban life and those who want adventure can have several choices to venture in. The environs of Lake Sebu make for a very ideal location to simply indulge in the wonders of pristine nature. Each morning, the lake greets you with a mist that would have you think the very placid blue lake actually evaporating as the sun rises. You would also wonder how come a lake that has no tributary can be so wide -- 354 hectares -- and deep – more than 2,000 feet deep. 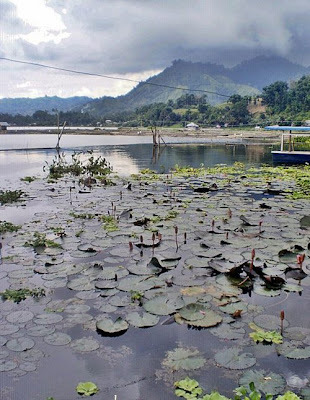 Lake Sebu town has three lakes, namely: Lahit, Sebu, and Seloton. Of the three lakes, Lahit is the smallest, and Seloton, although only 75 hectares wide, is much deeper than Sebu. If you get tired of the Lake you have the Dongon Falls to come to. Dongon Falls is now more popular by the name The Seven Falls. As the name suggests, Dongon Falls is a series of seven falls within a span of less than three kilometers. The first of the seven falls is the widest and the second is the tallest, dropping about 500 feet. Five of the seven falls are accessible via an inter-connected foot path that the provincial government built for visitors but since the area is within a forest, a guide may be needed if you want to walk to Falls Number 3 to 5. 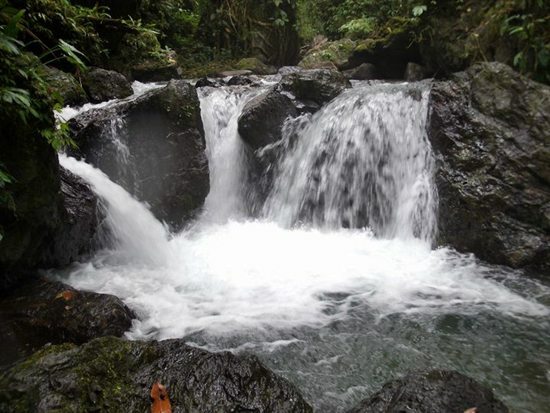 If your forte is mountain trekking, then I suggest you visit the Trankini Falls. According to those who have gone to the place, a trek to the falls, which is still undeveloped, is an experience of a lifetime. Flora here is also unique. "God was in his happiest moment when he created the flowers in Lake Sebu," a friend said. "It's as if God poured extra color and more cells to plants here." You will find plants that are hardly seen elsewhere: a plant whose flowers resemble a furry cat's tail only its golden yellow, gumamela that has flowers 8 inches wide or one that looks like a crumpled blood-red paper with streaks of milk, yellow bells that are about a foot long, and so many species that botanist would have a field day naming all of them. Two resort operators in the area have boating services for a fee of P450 per trip. But wait. This is much cheaper than you think, a boat can carry up to 14 persons. If you don't have this many companions, there are several groups who recruit additional persons who would like to join them. With you on the boat is a lady guide who will provide very significant information about the lake, the town and its people. She will also answer to all your queries, of course about the lake. "We are now in the deepest part of the lake. Experts say this part of the lake is more than 2,000 feet deep." "Once a year, the lake experiences what we call as "kamahong" or fish kill because…"
"That islet on your right used to be the burial site of the T'bolis living around the lake. It is a tradition of the T'bolis to wrap their dead in a white cloth and hang them on a tree to dry." The 30- 45 minute ride is definitely an educational ride. That's guaranteed. All the resort restaurants even the smallest carenderia in the town offer tilapia recipes. 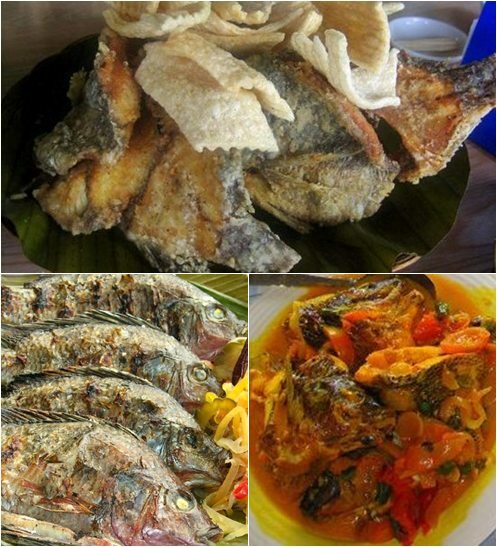 (The town is a major producer of Tilapia in south central Mindanao, even serving as far as Davao City.) You'll have choices from paksiw to tinolang tilapia, to the rarely heard chicharong tilapia, pinaputukang tilapia to tilapura (tempurang tilapia). An advice to those who are not used to eating this freshwater fish: Just take an initial bite. I assure you will be looking for more. In one of the resorts, you will be treated to a song-and-dance performance from T'bolis in the area while you have your meal. Take a walk or ride the "habal-habal"
I personally suggest taking a walk from Lake Lahit up to the zip line station, especially around 7:30 to 8:00 (the time the zip line operators start accepting riders) especially when you are a group. Even when the sun is high you don't have to worry of sun burn because you will be walking under the canopy of a forest. Although to first-time riders, taking the "habal-habal" seems daunting, the you will be treated to a magnificent view of the lake as you travel through Lake Sebu's winding road. Drivers of these motor bikes would also assure you that the trip is safe. 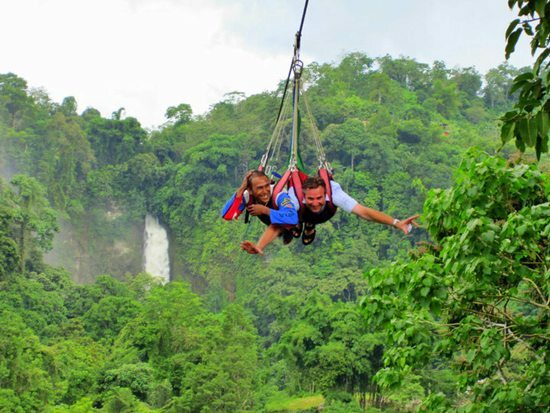 After taking the zip line, your most likely destination is Falls Number 2 where visitors stay the longest. The place is very ideal for taking pictures and for picnics. The area, however, is in one of the lowest part of the entire zip line park and everyone has to go back up the first station to where most vehicles are parked. To go up, ride a habal-habal. 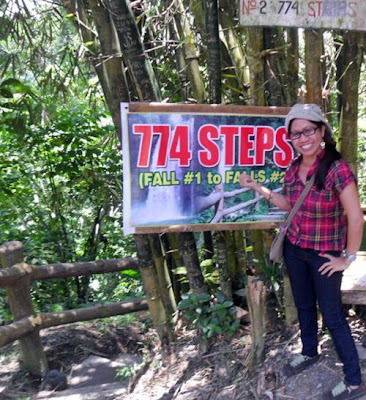 Or tighten your trainers' laces and take the breath-taking (literally) 774-step stairs. What's great about this route is you are climbing up via a forest, a natural habitat of monkeys. If your are lucky enough, these monkeys may walk by you. Another advice: The route is very ideal for those who have strong lungs and those who have much time to trifle away. Those who have companions waiting for them in a vehicle at the parking lot are aadvised not to take the stairs because this really takes so much time, not only because of the long climb up but also because you will definitely enjoy what you will see and hear along the way. The ultimate: RIDE THE ZIPLINE! Your Lake Sebu experience is never an experience if you have not braved the Seven Falls Zipline! Actually, you do not zip above all the seven falls. The first zip line starts just below Falls Number 1 -- a few meters above where the tallest Falls Number 2 drops – and ends below Falls Number 5. Imagine flying 600 feet -- yes, 600 feet, the highest in Southeast Asia -- above waterfalls, a river and a verdant forest. It's exhilarating! The first line is 700 meters long and takes about a minute to complete; the second line is only 400 meters long but the angle a little more steep that makes the travel faster. Safe? Yes, it is. Ask the staff who straps you into your safety gears and the zipline and they will tell you, the zipline is capable of carrying a load of 20,000 kilograms.